The walls have been formed of uncut stones, with large blocks on the outer side and smaller stones to the inside. These walls are about seven feet in thickness, however, only eighteen inched in height remain above ground level. 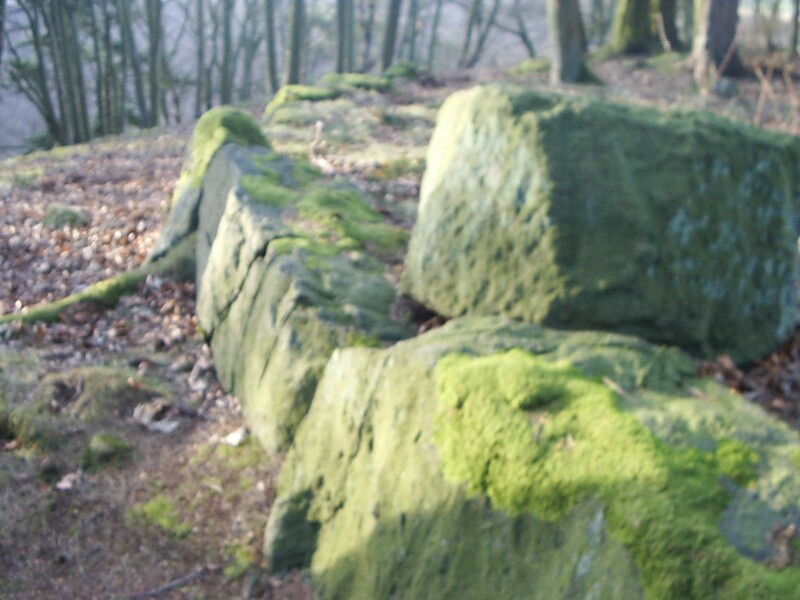 Many of the building stones have been thrown over the side of the hill. 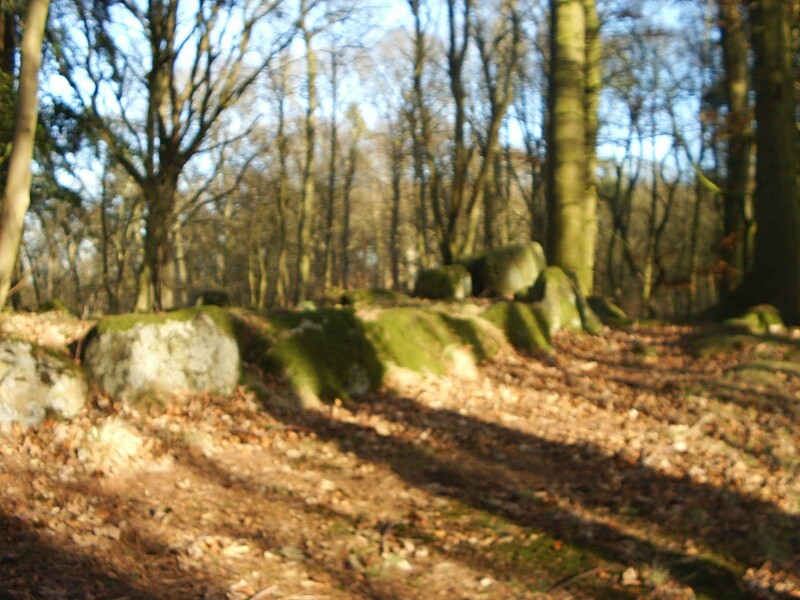 The position of the structure, being chosen as a place of safety from attacks by Danish invaders. Brochs are a special form of circular dwelling of dry stone construction, with one entrance for a barred wooden door, simple constructions to afford minimal protection against attack . Probably built around farm enclosures, with the intention of stopping straying stock, as well as affording safety from predators. St Bride`s Ring has been classified as such ie a fortified homestead—— lying in area of good agricultural land. Structures of this description built circa 1st & 2nd century AD, same era as the Ardestie souterrain complex. The church of St Bride was built at the time of King Kenneth (late 8th early 9th century), by Irish clergy. The stackyard of Kingennie farm now occupies the site. The ruins of the chapel were removed about the year 1832. Note: The Roman Catholic Chapel in Monifieth is dedicated to St. Bride. On Ethiebeaton farm there is a field known as Chapel Dockie, where another pre-reformation church had been situated. The name Dockie being suggested as a derivation of the name Murdoch, who may have been the dedicated patron saint of the chapel. Coffins have been found a short distance from the site of the chapel, in 1857 the then owner of the property stated between the years 1830 / 1835 a number of ancient coffins with human remains were found upon the nearby small hill. Hopefully this will answer a few queries for you. Always glad to be of help to those with an interest in past local history. This entry was posted in Articles and tagged Ardestie, broch. Bookmark the permalink. and detailed information you offer. It’s good to come acrosss a blog every once in a wwhile that isn’t the same unwanted rrhashed information. Fantastic read! It impressed, I have to say. Really hardly ever do I encounter a weblog that both educative and entertaining, and let me let you know, you have hit the nail on the head. This a really nice article! I couldn’t wait to cshare it with my friends. Wow, just wow! really really nice article on strengthening new blog. I live in the houses next to this forest, in South Kingennie, I found this very interesting as I played there as a child all the time and for many, many years. I’m now a History Student.